The wrecked Flow vehicle following the crash. The police have released the identities of two persons who were killed in a vehicular crash along the Old Harbour Road in St Catherine on Tuesday night. Dead are 41-year-old Lloyd McDean, a technician of Lorraine Avenue in Sydenham Villa, Spanish Town in the parish and 26-year-old Kimone Mitchell of Bryant Crescent, May Pen in Clarendon. 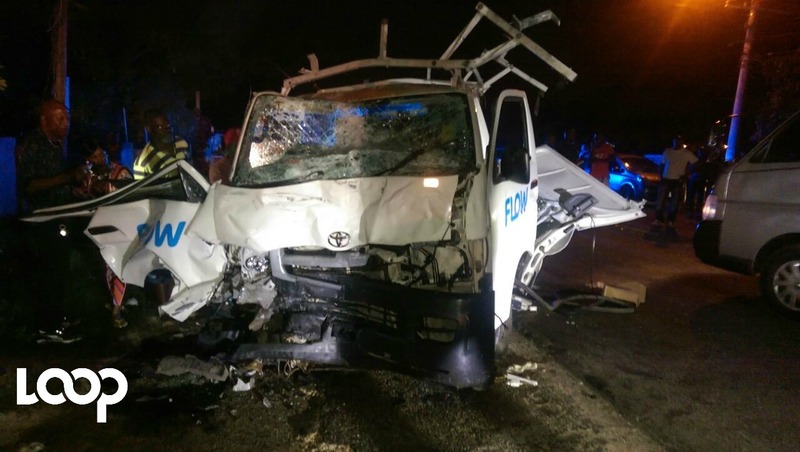 Reports from the Spanish Town Police are that about 11:30 pm, McDean was driving a Toyota Hiace minibus - being used as a utility vehicle for telecommunication company Flow - towards Kingston when on reaching a section of the roadway, he allegedly lost control of the vehicle which collided with a Toyota Coaster bus that was heading in the opposite direction. McDean, Mitchell and fifteen passengers that were in the Toyota Coaster bus sustained multiple injuries and were taken to hospital where McDean and Mitchell died while being treated and the other fifteen passengers treated and released. Another eight passengers who were in the Coaster bus escaped without injuries.